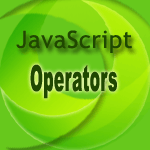 The typeof operator is used to get the data type (returns a string) of its operand. The operand can be either a literal or a data structure such as a variable, a function, or an object. The operator returns the data type. There are six possible values that typeof returns: object, boolean, function, number, string, and undefined. The following table summarizes possible values returned by the typeof operator. There is absolutely no difference between typeof myvar and typeof(myvar). The output of the following codes will be same i.e. "undefined". The following example tests the data type of variables.